‘What am I Doing Here? Ke Dirang Ha?’ is an exhibition of paintings and monoprints by artist in Botswana, Ann Gollifer exploring the condition of being an exotic in the exotic. Several of the pieces include vignetted photographic self portraits of the artist wearing high heels, carefully holding personal objects and memorabilia such as a wine glass, cigarette, her grandmother’s hand mirror or a small ornamental windmill. This concept of working with the female body was inspired by a second hand book of photographic nudes from the 1950s. These nudes are positioned under studio lights and shot as pin ups in random domestic poses. 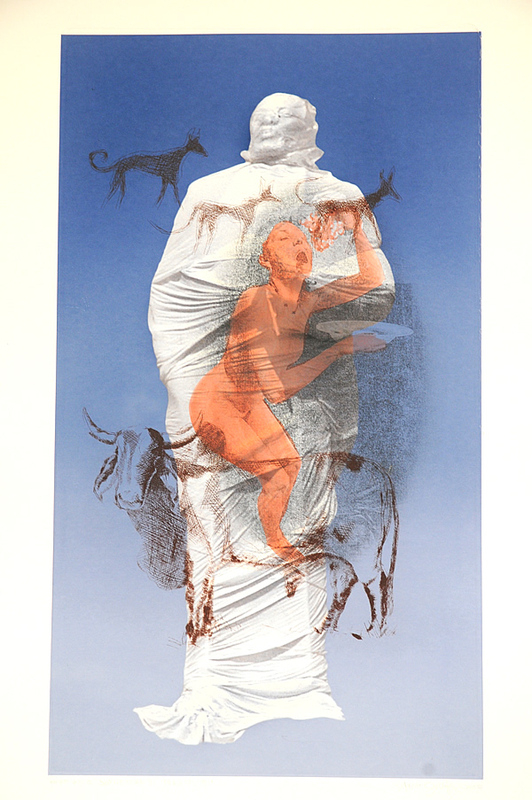 Overprinted on the photocopy transfers of Ann's self portraits are images that refer to Botswana, a line of village dogs, a Brahmin bull, a women collecting firewood or the statues of the three founding chiefs of Botswana; Khama, Sebele and Bathoen. The resulting work addresses the relationships or lack of relationships we have with the world around us. As Ann puts it, ‘I am seen but not seen. I see but do not see’. Although the references are personal, the sense of wonder and feeling of displacement are universal.